Top Romantic Bedding Sets for a Very Inviting Bedroom! My favorites are the beautiful and very romantic soft comforter sets full of roses and heart prints! How inviting and romantic is it? They are perfect for a newlywed couple or a very romantic single lady too! I gathered here on this page what I consider to be the ‘most romantic’ bedding sets and duvet covers for sale! Let’s see if you agree with me! Before you even ask, the answer is YES! You will get the cute and romantic pillowcases and the beautiful matching bed skirt as well! 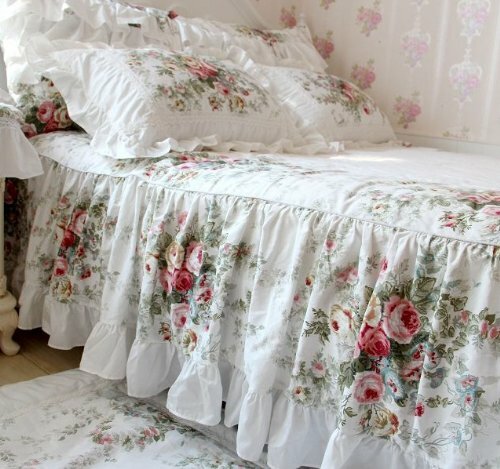 What a gorgeous and definitely very romantic ‘vintage floral’ bedding set! The rose prints are also very delicate and very girly! How can a girly girl not dream about her love day and night? What can be more romantic than a bunch of beautiful colorful roses, combined together in this gorgeous duvet cover? It is perfect to create a very romantic and inviting bedroom in a few minutes! It is available in three bedding sizes and you can also get the gorgeous matching roses pillowcases to create your own romantic bedding. 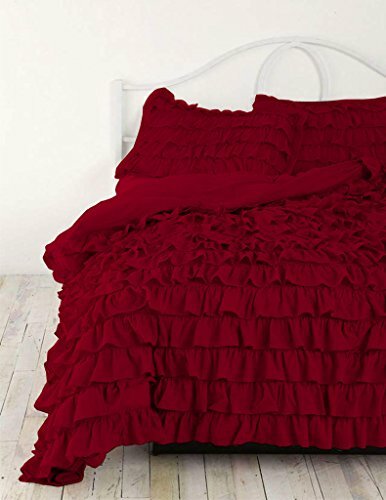 The Most Romantic Red Ruffle Duvet Cover Set! It is a luxurious 100% Egyptian cotton red ruffle duvet cover set available in six bedding sizes! It comes with 4 pillow shams. Stunning! As you can see I absolutely LOVE roses duvet covers! This gorgeous and very luxurious white roses bouquet duvet cover is beyond romantic! How perfect is it for a future bride to daydream about her wedding night? *You can also get the matching white roses pillowcases! Romantic HOT Pink Wedding Bedding Set! It exudes LOVE and romance! It is a 10-piece bedding set that includes the gorgeous heart design pillow covers as well! Perfect to share the most beautiful and sweet moments in your life! How creative, fun and very romantic is this cool reversible colors duvet cover with the words TOGETHER FOREVER written in colorful letters in several languages? One side is black and the other is gray. Just get two black or gray pillowcases and create your own bedding set! Can you think of a better Valentine Day’s gift idea for your girlfriend than this? 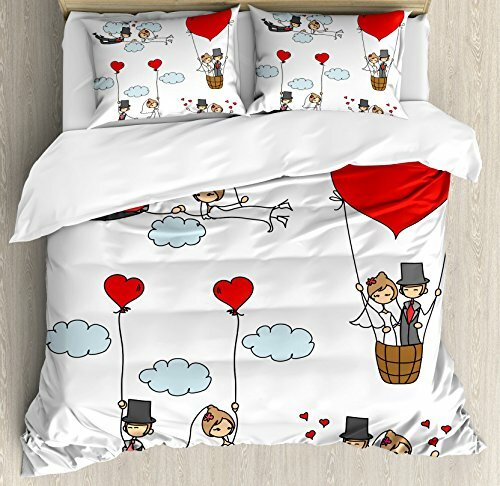 Another fun, unique and very cute bedding set for a couple’s bedroom! Perfect gift for your romantic wife! *Here are the gorgeous matching roses print king pillow cases! Another fabulous and very romantic floral duvet cover for girly women! It’s a cute red periwinkle flowers duvet cover! *Just get the matching red periwinkle flowers pillowcases! And I end my selections of the top most romantic bedding sets with this cute pink hearts bedding set! Will make a beautiful gift idea for any bride to be in the family! I’m sure her mind is filled with romance and dreams for her future married life! *I hope you enjoyed my selections here! *Cute, Fun and Romantic Pillow Cases for Couples! I love your comforters!! Please tell me where to buy them!! I want to buy the pink hearts one in Queen. Hi Celeste! Thank you so much! I am so happy you enjoyed my recommendations! I fixed all the links, so they should be working now… Thanks for visiting! I would love to purchase some of your bedding sets. Can you tell me how to go about this.